President Donald Trump on Thursday shared deeply-flawed polling numbers that overstated his overall job approval rating and falsely suggested it was “soaring,” reports The Denver Post. 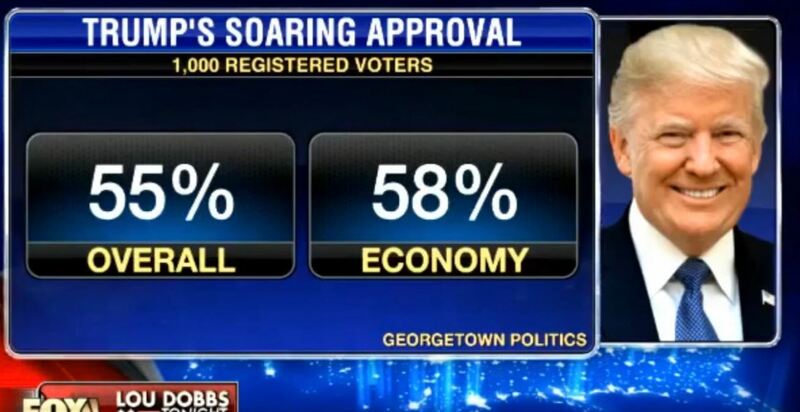 The graphic appears to have been created by the Fox Business Network and aired on “Lou Dobbs Tonight,” according to the Post. The erroneous graphic indicated that Trump’s overall job approval was 55% while his approval on handling the economy was 58%. The figure on the economy was correct, but Trump’s actual overall approval figure was 43% in the Georgetown University Institute of Politics and Public Service poll cited. In March 2018, Trump’s overall approval in the same poll was 42%. In August 2017, it was 43%. Mo Elleithee, director of the institute at Georgetown, took to Twitter to correct the record.